Easy-to-use clock for desktop with the ability to display several clocks in different timezones. Installation package includes clocks with more then 50 various skins. Built-in alarm clock with support of reminders. 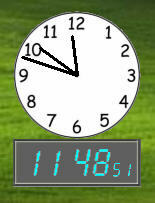 Replacement for standard Windows tray clock with excellent skins collection, alarms and add-ons support. It provides customization and flexibility for desktop clock and calendar. Sound and animation effects will make your clock even more attractive. This site does not contain serial number, crack, keygen Extra Clock serial number : serial number is the simplest type of crack. A serial number(cdkey,product key,etc) is register the program as you may already know. a crack or keygen may contain harmful software. If you cannot find the exact version you want, just give it a try. for more information read .nfo/.txt/.diz file include in zipped file.